Things I Wish I Knew When I Started Debugging Rails - Things I've learned related to programming. Recently I was thinking back to when I first starting working with Rails, and just doing development in general. A list quickly came to mind of things that I wish I had learned much earlier on. This post is a few of those things specifically about debugging. May you learn them earlier in your career than I did! Debugging. The core of the programmer existence. Or put in less grandeur: we make a lot of mistakes. Annoying typos, silent failing errors, or just plain wrong syntax. I’ve come to think that the best programmers aren’t those who make the least amount of mistakes, but those who are able to quickly and systematically find and fix them. puts "IS ANYONE OUT THERE"
Possibly one the oldest forms of debugging, just printing stuff to the screen is actually very effective. Watching the messages (or lack of messages!) can tell you a lot about what’s going on in the system. Even something like printing a series of asdf, asdfasdf, asdlfkjasdlfasldf; to chase down the code execution path can save you a lot of time tweaking code that’s not even being called. Most modern languages also have the ability to print useful interpretations of objects or variables to inspect their internal state. Something I’ve seen a lot in newer developers (and something I catch myself doing even now as well) is a vicious cycle of change after change hoping to see the correct result—only to take a step backwards and figure out that that particular section of code isn’t even being called. Le sigh. A step up from just printing out messages or data is to stop the execution flow and poke around yourself. If you’re in the Ruby world, pry is an amazing tool. Pry is very powerful, and it allows you to stop execution flow at any point by dropping in binding.pry. pry(Test)> puts "I can do anything here!" I can do anything here! You can do anything inside of the pry statement that you can do inside your project at that point in time. 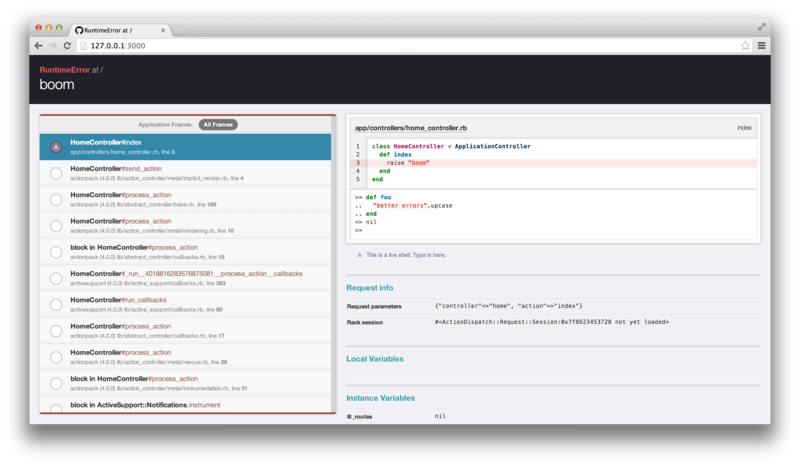 Inspect objects, instance variables, run database queries, check session variables, etc. Rails actually automatically adds a similar gem to any new project called byebug. It acts similar to pry in that you can invoke a console by typing byebug somewhere in the code. Both gems have similar mechanics. Type continue to continue the execution flow, or exit to stop it entirely (byebug also has a shortcut of c for continue). Better Errors is a gem that I will add to a lot of my projects. When an error occurs, it not only shows you a better representation of what and where something went wrong, but it also has an interactive console for you to poke around the state of the system when the error occurred. Rather than having to preemptively put in a binding.pry, Better Errors does that for you whenever an error occurs. The logs are your friend. They catch things you didn’t even know you’d need until you go searching for them. By default, when you run rails s, after the server starts, it will begin to print out logs as you use your webserver. Stacktraces can be an eyesore to look at, and sometimes even confusing or undecipherable. At least in Rails, the top of the trace is very useful for finding out exactly what went wrong. 99% of the time this is not useful to you, but near the top you’ll find more useful information. It will show you the type of error (500), which file it occurred in (app/controllers/home_controller.rb), and what line it occurred on: line three (...home_controller.rb:3). Reading the error message carefully and going directly to the problem instead of just a wildly thrashing the code will save A TON of wasted time changing things that aren’t even related to the problem. I never realized how useful logs were until a got a production bug report. Um, is there more information than that? Turns out, if you’re saving production logs, there is! If you’re using Heroku, there are several free addons that will capture past logs for a good amount of time (just search for “log” in the resources addons section). Learning how to search the logs (remember the useful bits of the stacktrace) will help you track down the seemingly impossible. Also, if you’re able to reproduce the error on production, you can tail the logs similar to how you do in development with heroku logs --tail <remote or app name>. I hope these tips will help you avoid pain and frustration throughout your dev career! If you have a favorite debugging tip I didn’t mention, I’d love to hear from you via email or on twitter. If you’d like to read some more tips, read on to Part 2!